Got up earlier than I generally like to on a Saturday, but I needed to get ready for today's Art Walk event. I gathered the last few works, dug up bunches of postcards, loaded up the truck and got downtown for the 10 am check in. I was assigned a spot on the corner of Main and Rt 71, in front of the Gilardini Ceramics and Broadway Grill. This gave me a very wide sidewalk and I could park in the lot behind the building, so I wouldn't have to move all my stuff very far. I ended up setting it up as you see in the above photos, using 3 racks facing inward toward the stores, and the fourth one extending backwards toward the curb to act as a buttress against the sidewalk's downward slope. 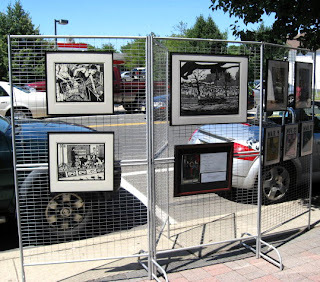 I hung the 8 prints, plus a mounted promotional piece, then waited for the viewers. On a beautiful June Satuday, there would be many passing by. Not everyone was downtown for the Art Walk, but many were, and a fair number of passers-by had some familiarity with the woodcut process. Perhaps the one negative on the day was the wind gusts that were likely more intense there at that wide intersection than further up the street. Most of the time it was light breeze that made the air comfortable even as it lightly rattled my framed prints, but one particularly strong blast almost sent my whole set up into the parked cars behind it, but I was able to grab it just in time. And I didn't sell anything, but I really wasn't expecting to. But mostly it was a good day. I met some other artists, handed out lots of cards, had a nice talk with a reporter from the Coast Star, and made tentative arrangements to do a lecture and demo at the Ocean County Artists Guild in Island Heights next summer. (these things are sometimes planned well ahead) At 3pm I began the process of taking it down and loading the truck. The next one of these is in August, an evening event. I have a while before I have to make a decision on applying for that.